Do you need money? Everybody does, am I right? But not everyone has time to become a Wall Street lawyer. That’s why you need a simple, 3-step system to guide you through the process of making millions from the comfort of your own home. Unfortunately, you won’t be hearing about that system from Russ “Winning in the Cash Flow Business” Dalbey or his wife Catherine, as they have been banned from stinking up your late-night TV watching with any of their infomercials. For more than a decade, the Dalbeys aired a seemingly non-stop barrage of infomercials, some hosted by handsome (now deceased) actor Gary Collins, that their program could teach users how to make hundreds of thousands of dollars in a single day by finding, brokering, and earning commissions on seller-financed promissory notes. The ads, many of which have been pulled by YouTube, though some are still floating around, mostly posted by scammers trying to direct viewers to their sketchy get-rich-quick sites, featured the Dalbeys and testimonials from users of their program who claimed to have made piles of cash, all while working short weeks and barely lifting a finger. Then it all came to screeching halt in June 2011, when the Federal Trade Commission and the Colorado attorney general sued the Dalbeys and their partners over allegations of deceptive and misleading marketing. Among the issues that the FTC took issue with was that the Dalbeys had made most of their riches, not from brokering promissory notes, but from selling DVDs and other program-related nonsense. The FTC also claimed that the level of success indicated in the customer testimonials was exaggerated. One woman, claimed the lawsuit, said her earnings had been inflated by $50,000 for the purpose of the infomercial. 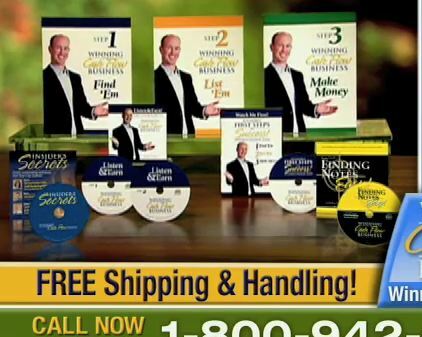 In all, around one million people paid anywhere from $40 for the most basic version of the program to thousands of dollars for seminars, coaching sessions, and lead lists, to the Dalbeys based on what was shown in the infomercials. In spite of promises about the ease with which anyone could make money using the program, very few did. Today, the FTC announced a settlement between it, the Dalbeys and the three companies they controlled from producing or distributing infomercials. They are also banned from telemarketing, and from marketing or selling business opportunities. There is currently a $330 million judgement against the Dalbeys. The twosome must now disclose their entire list of assets and repatriate all foreign assets in an effort to pay back as much of that money as possible.